I am ashamed of two things. 1) That in our quest for the cyborg life, we were beaten to the punch by SkyMall, and 2) that none of the following products are fake. 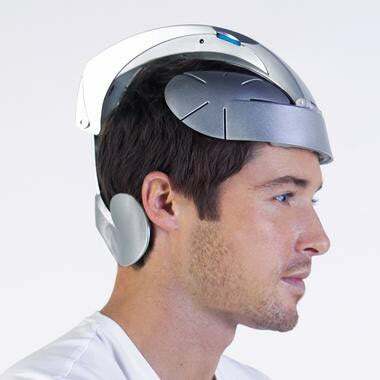 Let's just get this first one out of the way: Not only does the Head Spa Massager look like someone in the 1970s designed it in a future-Sparta fashion, but it's a massage helmet. You look ridiculous, and it can't even secretly double as a sexual aid. Every cyborg I know of has a head-mounted camera, and since this 5-megapixel Digital Camera Swim Mask is only good for 15' depth (that is, snorkeling or swimming pools), you might as well make the most of it and wear it on dry land too! Even has a cyborg-friendly LED that shines inside the mask, to let your friends know who's part robot tell you when you're shooting. If sci-fi tells us anything, it's that the bionic man (or woman) has great posture. Thankfully, the Posturetek Biofeedback System—it's a shirt, but they call it a system—"senses incorrect posture and gently encourages posture correction." My assumption is that it doesn't use sharp spikes or electric shocks, but it's still a tad sinister. When you embark on the man-machine merger, it makes sense to complement some of that silicon with silicone, if you catch my drift. Hell, you got so much going on, nobody's going to notice that you've shoved some Body Figure Enhancing Pads down your pants. Well, they'll notice, but not in a bad way. What good is the cyborg life if it doesn't permit you to jump higher, run faster, have more energy, appear 2" taller and "look like a million dollars"? The Gravity Defyers (spelling lessons sold separately) have been tempting travelers for ages with those very promises. Besides, its patented spring-loaded sole is found on no other shoe in the world pretty much ever, for some reason. Locutus of Borg wasn't much of a jumper—his footwear of choice skewed toward the comfort-illumination lines. That's why he swore by the Brightfeet Lighted Slippers. They're just the thing to slip on when you're making the midnight trek from the regeneration chamber to the cube pissoir.